Let’s have some fun with the ol’ holiday of love shall we? You may or may not remember that many moons ago I had a first marriage. It was short and not too sweet, even though our wedding day was none other than February 14th. That’s right, today would have been my 15th wedding anniversary! That marriage was not made to last, thankfully and by God’s grace I will be celebrating my 5th wedding anniversary to my husband this summer. After what I like to call my “trial run” first marriage, I decided that I would not let a poorly chosen wedding date ruin my future Valentine’s day plans. Of course even now we aren’t big on the holiday, but everyone loves chocolate right? I figured that there must be others out there with less than ideal Valentine memories so I put out the call for a few confessions. And y’all sent me some doozies. Ouch! Is it the 15th yet?? 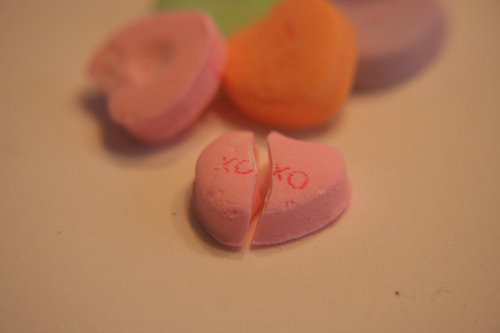 Anyone else have a less than ideal Valentine’s Day memory or are you just sick of the whole thing? Share your confessions in the comments or anonymously here. And buck up! For tomorrow is a new day full of half-priced candy. We share something in common Andrea. I was married before and it was short as well. I would have been celebrating my 13th wedding anniversary. Paths change and we get on a better shaped path. I am so happy they do change indeed as I have my two beautiful girls along with a wonderful hubby and you have your two handsome boys along with a wonderful hubby. Happy Valentine’s Day Andrea! I’ve never been a huge fan of Valentine’s Day, and I think it goes back to that stupid tradition that my school had in which friends bought friend’s candy on Valentine’s Day. I was always happy to get my candy, but I couldn’t help but notice all of the other kids who received none. And now my children’s school is creating the same stupid tradition. Who thinks of these things? I can also relate. My ‘trial run’ first marriage fell on Sweetest Day. Not that we planned that date, we simply wanted October for the weather. But like you, we don’t let that spoil the day from here forward. And I love your logic about half-priced candy starting tomorrow! I don’t mind Valentine’s day…what I do hate is the pressure to BUY BUY BUY! I prefer a home cooked meal and a night snuggling watching movies on the couch to a crazy expensive dinner!